Yea people in Nepal do not realize the potential of brands especially the 'logos'. It is highly marketable and they could make so much money selling apparel and accessories. Not sure how big the Nepali market is, but certainly Nepali sports clubs and federations should try to create a recognizable symbols - be it logo, shirt design, mascots and develop a strategy to translate that into revenues through merchandising. I would think that the Nepalese market can be pretty huge. The thing is football is big among the Nepalese people. They need to promote logos, shirt designs, etc. and the only thing needed would be for the games to be shown on tv. Imagine how big that would be. More sponsorship. I don't know why Kantipur Channel or other Nepali media don't cover these games. After a few years, their revenues will soar. Thats what we football lovers looking for since long time, Nepal Nat. jersey should be symbolic, unique and it must be easy to recognize as Nepal jersey so ANFA must think for it as they have to have nice crest and own design. 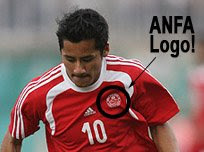 Regarding the brand ANFA is using these days ADIDAS Jersey but there's no any particular design and whatever they have in the stock only so ANFA or some business companies or Brand must prepare for own design for Nepalese National Football Jersey. I'm a national team football shirt collector in Canada. Would anyone be able to help me get an official Nepal National Team shirt? Sorry I missed the reply for so long. I must have forgot to set notify of follow up. Are the shirts available in shops there? I know some teams use "unofficial" kit and it causes a grey area for collectors. We generally don't like to finish a shirt ourselves. If it can at least come from the country in question it helps.